Consider getting together with the neighbors to plan an end of summer block party. Designate set areas of your neighborhood as “stations” for food, drinks, dessert, music and games! 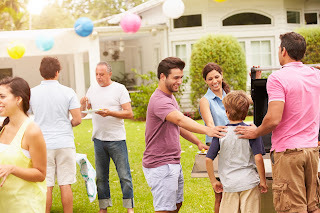 This is a great way to connect with your community and create summer memories to last a lifetime. · PREHEAT oven to 350 degrees F.
· COMBINE all ingredients and spoon into a shallow 1-quart baking dish. · BAKE 20 minutes or until mixture is heated through; stir. Garnish with chopped green onions if desired. · Serve with crackers and/or vegetables. Didn’t get a chance to take a vacation this summer? Bring the tropical island life to your home! A Labor Day Luau is the perfect way to indulge in paradise with your closest family and friends in the comfort of your own backyard. Break out the leis, grass skirts, Hawaiian shirts and enjoy your favorite drink inside of a coconut cup. This is a great way to end summer on a relaxing note. Enjoy the last major holiday of the summer with a bonfire. Bonfires are relaxing, tons of fun and easy to plan for! Be sure to check with your city or township first to see what regulations apply. Then gather your friends and family around the fire for roasted hot dogs and delicious s’mores while reminiscing over your favorite summer memories. Whatever you decide to do to celebrate the end of summer, we hope that you enjoy a happy and safe holiday weekend! Community Financial Credit Union has been actively involved in building stronger communities and enhancing the lives of its members for more than 64 years. When Starkweather Academy in Plymouth wanted to jumpstart a music program last year, Community Financial Credit Union was there to help the school afford musical instruments and a PA system. For the second consecutive year, Starkweather Academy is one of the recipients of our Summer of Sharing program, which donates $1,000 a day for 60 days to local charities. This year the grant will be used to help buy around 100 books for the Academy that Starkweather teacher Emily Szachta says will help the students immensely. Gaining community support for Starkweather Academy can be difficult, because the school is not as visible as the more traditional high schools in the area. Szachta says having partners like Community Financial is critical to the success of Starkweather Academy. “We couldn’t afford new supplies without the help of organizations like Community Financial,” said Szachta. Community Financial has been actively involved at the school for the past three years through the Student-Run Credit Union Program and by providing financial presentations to students. Starkweather Academy Alternative High School promotes lifelong learning by offering a comprehensive educational program that addresses the individual goals of each student. The roughly 200 students that attend the school are mostly from the Plymouth-Canton and Livonia school districts. Community Financial is proud to have donated $300,000 through our Summer of Sharing program since 2011. This year, the 2015 campaign runs through the end of August. 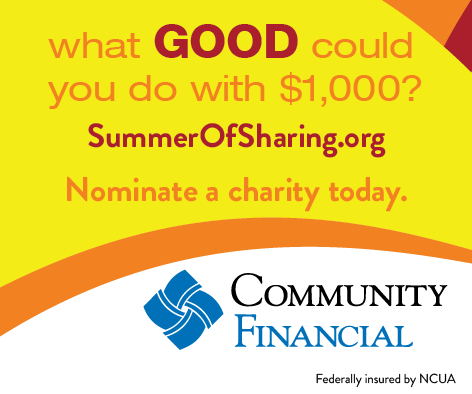 To learn more about the Summer of Sharing and to see all of the organizations we’ve helped this summer visit www.SummerOfSharing.org. Well, you did it. You’ve graduated and been accepted to your dream college. So now what? 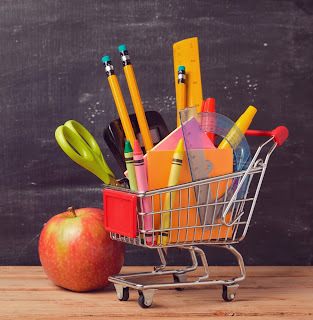 Even though you have the whole summer ahead of you to get ready for this next chapter, getting ready to go away for school does require some planning ahead. For me, living in a dorm was sort of like one awesome extended sleepover. Unfortunately, it also costs a heck of a lot more than I expected just to move into my dorm room in the first place. If you’re heading off to college for the first time, make sure to plan accordingly. You’ll need a bunch of new stuff, and it’s going to cost you some money. Thinking of raiding your parents’ linen closet instead of buying new bedding? Think again. 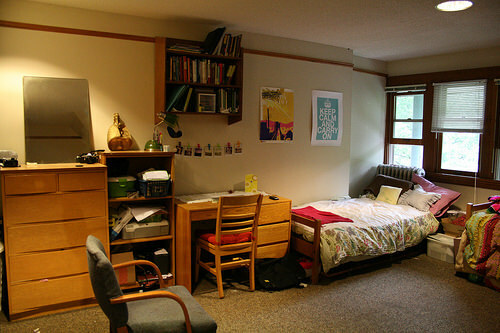 Most college dorm beds require extra-long sheets–the type your folks aren’t likely to have. Taking stuff like pillows and blankets from home isn’t a great idea either. If you haul it all away to college, it won’t be there when you come home to visit, and lugging a comforter back and forth just isn’t going to work. Your best bet is to buy new bedding, and you can expect to spend at least $75 for a basic set. Sure, you’ll probably spend a fair amount of time studying and going out with friends, but you’ll still want some basic entertainment in the comfort of your dorm room. This means there’s a good chance you’ll need to buy a TV, and probably a DVD player to go along with it. These days, you can score a DVD player for as little as $30-40, but a decent TV might cost you $400 or more. Your room and board fees should cover a basic meal plan, but what happens when you get hungry at 3:00 in the morning during an all-night study session? Midnight (or post-midnight) munchies are common among college students, and to indulge your craving, you’ll need to invest in a mini fridge. Some schools have these available for rent, but that might cost you almost as much as buying your own. Most models start around $65. Throw in a microwave, and you’re looking at over $100 to ensure a steady supply of food and snacks. The laptop you used throughout high school–you know, the one whose battery dies after 12 minutes–probably isn’t going to cut it once you get to college. You’re going to have notes to type up during class and papers to write, so you’ll need a reliable laptop from the start. While you can go cheaper, the average laptop will run you about $600. Throw in a printer, and you’re looking at another $100. You’ll need to invest in a new wardrobe if you’re going away to school in a different area of the country. If you’re headed for a warmer climate, you’ll need to stock up on shorts and, if you’re lucky, beachwear. On the other hand, if your school is known for its harsh (or in my case, extended) winters, you’ll need to purchase snow boots, warm clothing and a serious supply of gloves. Some colleges don’t allow freshmen to have cars on campus, but if yours does, and there’s no public transportation in town, you may be tempted to buy one. Even a used vehicle can cost several thousand dollars, so be sure to have a decent chunk of money on hand before you go car shopping. Preparing for college can be stressful on many levels, but try not to let the cost of everything wreck what should otherwise be an exciting summer. Budget accordingly, and with any luck, you’ll get all the stuff you need to start off on the right foot. Photo by Yujean Park via cc. By Maurie Backman Copyright 2015 brass Media, Inc.